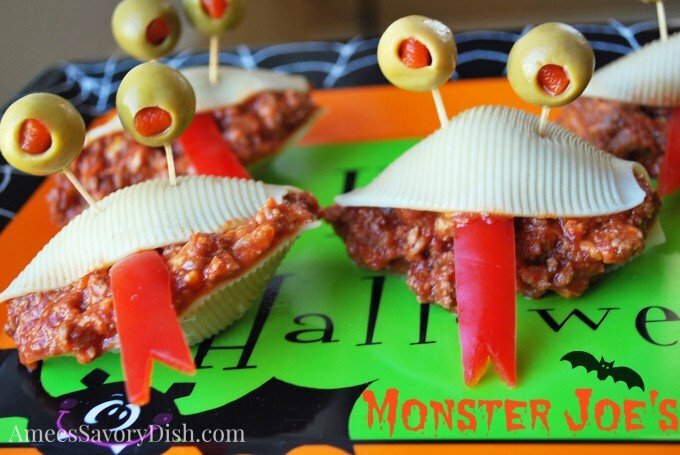 Monster Sloppy Joes are a fun twist on traditional sloppy Joes, perfect for a kid friendly Halloween dinner. What’s not to love in these little guys?! Cooked pasta shells oozing with cheesy sloppy Joes filling are sure to win smiles. You can make this a fun DIY dinner and let the kids stuff and assemble the monsters themselves. Special memories are created when kids can be creative and take part in the preparation. Especially,when it’s a fun themed meal. This recipe is made with a Homemade Sloppy Joe filling and makes a perfect Halloween dinner. After you make this festive Halloween dinner recipe, please take a photo of your monster sloppy Joes and share it on my Facebook page! Amee, this is so great and so creative! You probably intended this for younger kids but my youngest son is 16 and I know that he and his friends would love this! Even my husband would love it! I might just have to surprise them on Halloween and make Monster Joe’s. This is a very creative and delicious Halloween meal. Everyone will enjoy your creative not so scary sloppy joe’s. Thanks for sharing with Foodie Friends Friday party this week. Will pin and share this weekend.